Shanghai has four railway stations altogether, Shanghai Railway Station, the South Station, Hongqiao Railway Station and West Railway Station. Shanghai Railway Station is the oldest one with the largest passenger flow volume among the three stations. Passengers from the station can reach all the main cities, such as Beijing, Xi'an, Chengdu, Nanjing, Hangzhou, Harbin, and Hong Kong (Kowloon). The South Station is seen as the south gate of the city center. Trains from there mainly leave for Guiyang, Changsha, Shenzhen, Xiamen, Nanchang, and other cities. Hongqiao Railway Station is the newest station in Shanghai. It operates high speed and bullet trains only. West Railway Station mainly operates bullet trains to/from Kunshan, Suzhou, Wuxi, Changzhou, Danyang, Huishan, Hefei, and Nanjing. Absolutely, with pleasure. The booking service and guideance was quick, to the point and professional – and I have quite a good comparison, since I had contacted three or four other agencies before I decided to choose Travel China Guide. I liked that Your agent combined several of my ticket requests into one, thanks to which I paid only for one delivery. When I noticed the tickets were not in my hotel, I called the agent and they pushed the delivery to as fast as possible, which was also appreciated. Also the level of English of the agent was very good, which can be a major obstacle with travel agencies, many hotels, airports and train stations. We were very pleased with the service we received from your company. We were traveling on China Rail at a very busy time (especially May 1and May 4) so we were so glad we pre-booked our tickets! There were so many people queued to buy tickets at the main stations in Shanghai, Beijing and Xi-an. Having the tickets delivered to our hotel allowed us to move more quickly through. The service provided from your side was very good and clear. Not really anything to add besides positive compliments for the service offered. We will surely use your company again. It was a nice trip to China. I have booked two train tickets for arrive in different destinations - Shanghai to Yiwu and Yiwu to Guangzhou. The train trip was perfect, on-time and your support as a travel agency also was perfect. We had a wonderful time traveling by high-speed trains in China this year. We visited five cities plus Huangshan: Shanghai, Yangzhou, Nanjing, Tunxi, Huangshan, Hangzhou, and then back to Yangzhou and Shanghai. Several months before our trip, we reviewed the train schedule on the TravelChinaGuide's website and selected the trains and time that suited us. We paid with a US credit card and sent photocopies of our passports. This was the first time that we had ordered train tickets in this manner. We were interested to see how well this process would work. Well, our worries were totally unfounded. All six segments of our trip were by high-speed trains and all the tickets were waiting for us at our first hotel when we arrived in China. decade. It completely changed how I view distance in China. What used to be a 4-5 hours train ride is now 2 hours. For example, getting from Nanjing to Huangshan would have taken us an entire day by train. But, now with high-speed rail this entire trip took 4 hours only. Taking a plane would require us to get to the airport 2 hours before the flight. Sometimes weather would delay the planes. But trains are punctual like clockwork. Plus, you will see the countryside at ground level. I am looking forward to the days when China will offer a "China-Rail-Pass" similar to the EuroPass. High-speed train is the way to go! I want to know if there are direct trains from Shanghai to Wenzhou? Can I have your schedule and where can I get the ticket? At which station? There are around 47 direct high speed trains to Wenzhou and they depart from Hongqiao Railway Station. They run frequently like every 10 to 20min. You can input the cities and date on our website for detailed schedule. You can buy the tickets at any railway station in China mainland. If you are interested in booking ticket online in advance, you can submit your booking on our website too! We are very pleased to offer this booking service for you. Thank you. Does the speed train got wifi? wifi hardly find on high speed ride. Hi, I would like to ask about the hongqiao railway station timetable and the ticket fee as I want to know from Hongqiao to Ningbo is how long and how much it cost by high speed train. There are around 50 high speed rides a day from Hongqiao Railway Station to Ningbo taking 1.5 to 2.5 hours. The earliest one departs from Hongqiao Station at 6am and the last ride is at 8:35pm. A second class seat costs CNY144 per ticket, CNY237 for first class seat and CNY444 for business class seat. Hope this information can help you. If you take subway line 2 directly (with a transfer at Guanglan Rd. ), it takes around 90min ideally. The price should be CNY9 per person. If you use meglav to Longyang Rd first, it can cut the trip a little shorter. The one way ticket for this meglav is CNY50 per person （CNY40 if you can show a flight ticket for that day). The meglav runs around every 15-20min. From Longyang Rd, it would be CNY5 per person by subway line 2 to Hongqiao airport. Can I pick up the online bullet tickets at the Maglev station or at the longyang metro station? 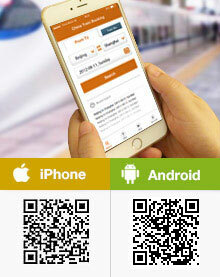 You need to collect the ticket at the railway station, the maglev or metro station would not work.